I recently had my first solo garage sale. I did them with my mom when I was a kid, and I've contributed to them as an adult, but this was my first big one on my own. Having two kids under the age of 3, I knew I had to keep it simple. I needed to do whatever I could to get it done, but also not stress myself out anymore than necessary! It's enough work and time as is! The first thing I did was to group all like items. I saved as much time as possible by throwing things that are the same together, and putting one price. I.e. books are 50 cents. DVDs are $1. Shoes are $2, etc. This alone saved me so much time! Most of these things I threw in a box, put the price on the box and called it good. It makes it easier on shoppers, too. If you are selling clothes, sort them by size. I have gone to garage sales before where baby and kid clothes are all thrown together on a table and you are digging through hundreds of items trying to find stuff in your size. I can't imagine anyone sells stuff that way. I had so many baby girl clothes to go through, I knew it would be insane if I didn't sort them. So I sorted them all, and while it did take a bit to do it, it saved me time during the sale and it made it easier on shoppers which = more sales for me! The way to make this easier on yourself is don't fold or organize them once you've got them ready for your sale. Just dump them all out on a table and label which size is which. I have seen sales where they've taken the time to fold and nicely lay out every single thing, and then the crazy garage sale-ers dig through and make a mess of it all anyway. As long as it's organized by size, people will dig through to find what they want! Advertise smartly. In this area, people aren't checking the newspaper anymore for garage sales. They are looking on Craigslist, Facebook, etc. It's free and it takes way less time. I wrote up a quick little blurb about some of the main and bigger items we were selling, and put it on Craigslist and on a local Facebook sale page. Make sure to put a catchy title, or it'll get lost among the hundreds of other ads. As far as yard signs, apparently it isn't legal to post them in some places, so you'll want to check on that. If it is, make a big, bold, simple sign out of poster board and make sure to put them in a "trail" for people to follow from the main road. Have a plan for after the sale. I think majority of people who are throwing a sale want to get rid of stuff. For me, the extra cash was great, but we just downsized big time and I needed things to go! Having stuff that didn't sell come back into the house was not an option for me. I kept boxes (you can see in the photo above) under the tables so that when my sale was over, I could throw the cheap stuff into the boxes and head directly to Goodwill with everything. There were a few bigger things that I knew I could post on Craigslist or on the Facebook sale page I'm on, so I took photos of those and posted them the same afternoon. If they don't sell within a week, they are getting donated as well. Make sure you know what you're going to do with stuff after the sale. Not everything will sell, so decide ahead of time whether you are keeping things, trying to sell them elsewhere, donating or trashing them. Otherwise you'll be tempted to keep it after all...just in case. Work ahead of time. Get everything set up and ready to go a day or two before your sale so you are not up late the night before stressing to get things set up. It'll just make things easier if you know its all ready to go! 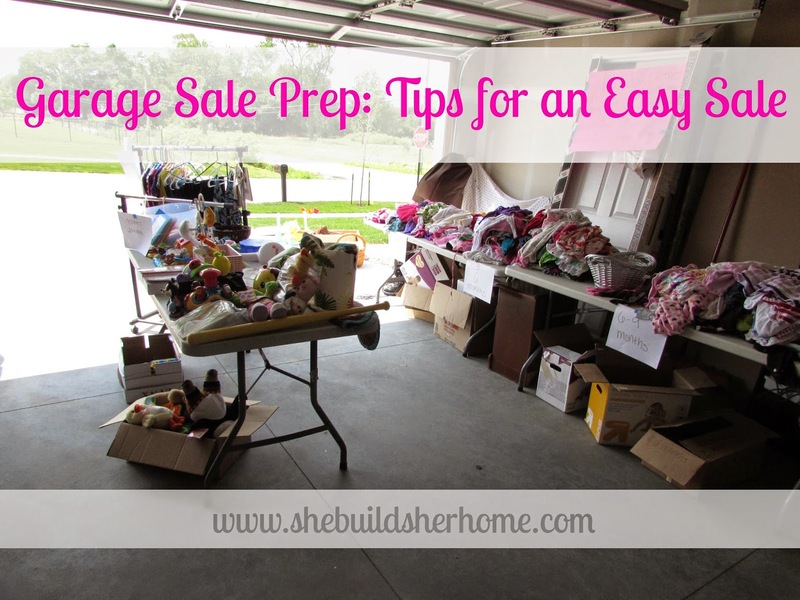 Any other seasoned garage salers out there with great tips for a successful sale?! So You Want to Find a Church?